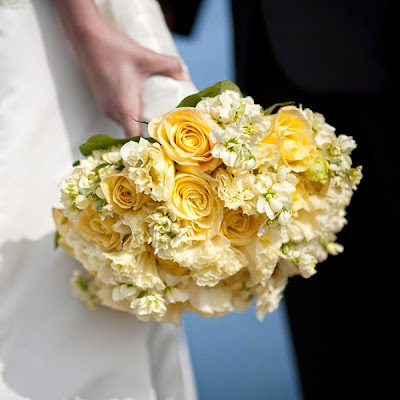 Yellow is one of the most cheerful colors to use for a wedding. Whether it is your primary color or simply an accent, touches of yellow are a wonderful way to dress up your ceremony and reception. Use these lovely yellow wedding details as inspiration to get you started. 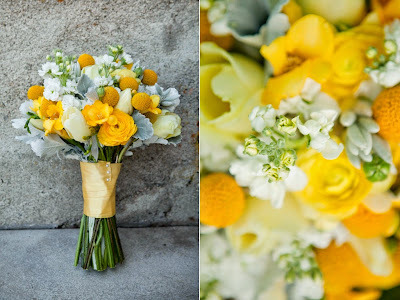 The flowers are the perfect place to begin gathering yellow wedding details. Spring flowers, in particular, are so pretty in soft shades of yellow. For a pure yellow bouquet, romantic flowers like ruffly sweetpeas, French tulips, or big garden roses are simply gorgeous. They can easily work for many different styles of weddings, including a simple garden wedding or a more formal indoor affair. Use the ribbon and other bouquet wraps to help set the tone for your yellow bouquet and to tie it in with the rest of your wedding style. A light green gingham check ribbon, for instance, would be casual and country tied around a bunch of yellow sweetpeas, whereas the same bouquet adorned with a wide ivory satin ribbon would feel much dressier. Yellow flowers also work beautifully as an accent with other colors. A great look for an informal summer wedding would be centerpieces which feature yellow gerbera daisies mixed with the same flower in hot pink and orange. For a romantic vintage look, try combining a few pale yellow flowers with shades of lavender and deep purple. Or go for a very fun effect by using a mixture of yellow and green flowers set over a clear vase filled with fresh lemons and limes. It will be a fresh and unexpected detail. You may also wish to bring hints of yellow into the wedding attire. Pale yellow can be a soft and feminine color for bridesmaid dresses, but be wary of bright yellow which can be very hard to wear. 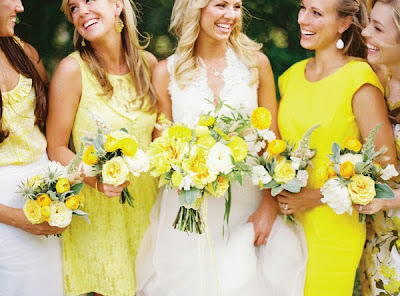 If a solid yellow dress is a bit much, look for bridesmaid dresses with patterns which incorporate touches of yellow. An especially beautiful idea for a summer wedding would be white eyelet strapless dresses with yellow embroidery. Sets of pearl bridesmaid jewelry would provide the perfect finishing touch. The white pearls in the bridesmaid jewelry sets will look fresh and bright against the yellow accents. 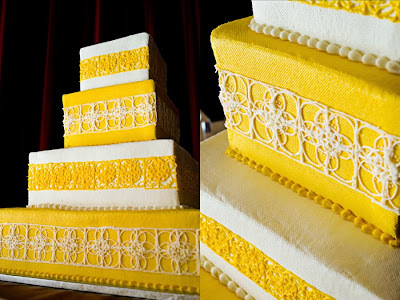 The wedding cake is a wonderful place to add a bit of yellow. The classic style of pale yellow frosting roses on a creamy buttercream cake is pure elegance. A yellow basketweave design topped with fresh flowers is another lovely showpiece for the reception. Keep in mind that yellow can also be sophisticated. One only has to see a white fondant cake with square tiers decorated with exotic yellow orchids to know just how chic yellow can be. From bright to subtle, romantic to exotic, there are a number of ways to enhance your wedding with creamy yellow accents. The details will add a lively cheer everywhere you choose to use them, be it the centerpieces, table linens, invitations, or attire. The happy feeling of yellow is perfect for a spring or summer wedding.